1566 The last Duke, Jacopo IV Crispo is cashiered by the Sultan. Sifno had already been occupied by the Ottomans in 1537. The Syphnian Treasury is one of the most impressive works of art visitors see in Delphi, the site of an important Greek oracle. In order to understand how the inhabitants of this small Cycladic island managed to offer Apollo a temple competing with that of Athens, one must bear in mind that Sifno was rich in silver and gold mines. Old Sifno (or Sifanto) was built on an isolated hill on the eastern coast of the island. Today it is known as Kastro (castle), because the site of the ancient acropolis was fortified by the Venetian rulers. It is no longer the administrative centre of the island, which was moved in 1836 to Apollonia, a village located in a more central position. The houses surrounding the top of the hill were built in order to form an enclosure: access to the town was limited to a few archways. 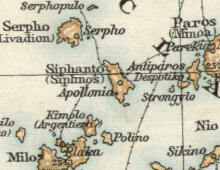 The inhabitants of ancient Sifno were so rich that they could strengthen their acropolis with marble stones from Paros. The Venetians built their fortifications on top of these walls. The cliff below the acropolis is very precipitous thus Sifno could not be attacked from the sea: it was very difficult to land at the only cove near the castle. The residence of the lords of the island was located at the top of the town: the shapes of some buildings show their Venetian design and there is a coat of arms of the Crispo family, the last dukes of Nasso. The Ottoman occupation did not have a major impact on the everyday life of the inhabitants of Sifno; the families of Venetian origin retained their influence and in the XVIIth century large churches were built or renovated. Many parts of the island show the result of centuries of hard work to terrace the hills and obtain some farming land. The Venetians introduced the breeding of domesticated pigeons: in Tino there are isolated dovecots, while in Sifno the birds were sheltered under the roof of the farms (in Italian a theatre gallery is called piccionaia - dovecot). The donkey was too busy to notice my camera, but the two ladies were quite happy to properly pose. The image in the background of this page shows a detail of the cathedral.